You’ve already promised that this is the year to take your business to the next level, and that means finally launching a website. The only problem is that you have no idea where to park a new online home. 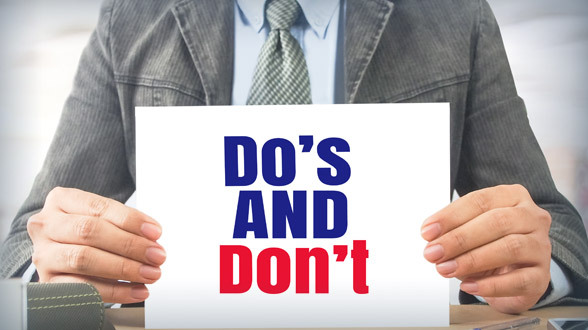 To help out, we’ve used our years of experience to put together this list of the top 5 do’s and don’ts of choosing a hosting provider. Here’s how to learn from our mistakes while achieving success. DO: Research each web hosting plan thoroughly. DON’T: Simply go for the cheapest plan or the one with the most features. Surprised? Maybe so, but there are many other that think that a laundry list of apps or access to unlimited resources means a potential web host is the best in the biz. Here’s the problem with that idea: There’s no point in paying for features that will never be used. Furthermore, cluttering up the control panel with plug-ins and widgets will only drain resources and make it harder to find the apps that are needed. It’s essential to know what’s important and to identify which hosts are going to fulfill those needs. Thousands of free site templates can save serious money on a custom design, but are they functionally and aesthetically pleasing, or are they all overly generic and clumsily designed? Customer support is always a good thing to have, but are agents on standby 24/7 or only during business hours in a time zone that’s several hours behind or ahead of their customers? When getting ready to advertise the site, will there be free credits to play with and SEO tools at your disposal, or is it to each his own? Until you’re able to ask and answer those questions, don’t commit to any hosting agreement that may be regretted later on. DO: Take skill level, experience and goals into account. DON’T: Be too ambitious or assume platforms are one-size-fits-all. We have some bad news… Nobody can do everything, and neither can a web host. That might be hard to read, and even more difficult to accept, but that doesn’t mean it isn’t true. Web design can be complicated, and those trying to run before they can walk is a recipe for half-baked designs, broken pages and a frustrating experience for both the site owner and their audience. Similarly, don’t expect a web host to help achieve things it was never set up to deliver. Some platforms are geared toward small businesses, while some are especially good for bloggers. Knowing that ahead of time will help keep disappointment and frustration to a minimum. If starting a blog or a small business is the goal, a platform like iPage makes it easy to add a blog and an ecommerce app. When choosing a website, find a platform suitable for your needs and current skill level rather than convincing yourself that you’ll suddenly have the time to learn HTML or get acquainted with Python. The last thing to do is to pay for a hosting plan that isn’t being fully taken advantage of. Choose a platform that aligns with the site goals, and choose a drag-and-drop site builder and some templates too. That will put anyone on the path to a fuss-free way to go from sign-up to launch with minimal stress. With the structure of the site laid out, it is now the time to funnel extra time and energy into marketing, communicating with clients and creating new products — you know, the stuff you’re already good at. DO: Read the fine print thoroughly. DON’T: Make assumptions or get caught unaware. We love a great deal as much as the next person, but experience has taught us that rock-bottom prices don’t always translate into long-term savings. Take domain names, for instance. Many web hosting platforms offer a free domain as part of their initial sign-up package. That’s awfully tempting when someone is eager to save money while launching a business, but the devil’s in the fine print. That is why it’s so important to choose a provider that offers a money-back guarantee, like eHost and their 45-day money-back guarantee on all plans. After the first term of the contract, that “free” domain is likely to jump to a premium price upon renewal. Thanks to that markup, customers could end up paying double for their domain names or risk losing it, erasing any savings they managed to rack up. Consider registering a domain with a company separate from the web host. It can be very convenient to have all accounts under one roof, but that convenience disappears if the host goes under and takes the domain with it. Be sure to own the domain rather than unknowingly leasing it from the host. Be very clear about which features are included in the chosen hosting package and which are add-ons. Purchasing daily backups, site security, an integrated shopping cart utility and extra bandwidth can turn a supposed steal into a serious budget buster. Know the lingo. “Unlimited storage” sounds fantastic, but there’s always a catch. Read their TOS (Terms of Service) agreement, and look for a section titled something like “CPU/Server Usage” that outlines how much storage the site will truly have and what happens if those terms are violated. Typically, that means risking hefty fines or terminating of the hosting contract, so know the limits early on. DO: Look up reviews of different web hosting companies. DON’T: Take them at face value without considering what those reviews actually mean (and who wrote them). 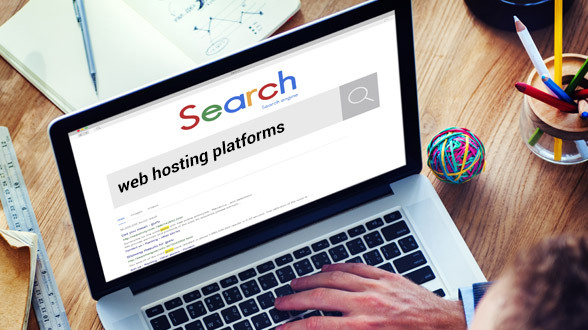 User reviews of web hosting companies and lists of the top 10 web hosting platforms can be valuable tools for anyone trying to compare multiple hosts, but only if knowing how to sift through whatever information is found is something that can be dealt with. Make a list of what’s important in a web hosting company, and look for those qualities within other people’s reviews. If the site owner is 100 percent sure that a discussion forum is never going on their website, then does it really matter if some unsatisfied customers rated the platform poorly because they didn’t like the way the free forum app was designed? Not so much. Secondly, don’t let a few one-star write-ups taint a company for good. Instead of basing a decision on a couple negative reports, look for patterns. If one person says the control panel is slow, then it might be an isolated issue related to the internet connection rather than problems with the server. If, however, multiple people in a variety of locations report page lags, then probably put that in the “con” column. Lastly, take the size of the web hosting company into account when weighing bad reviews against good ones. It’s a game of percentages, after all — no platform has a perfect track record, and statistically speaking, one that services five million customers is bound to have more negative reviews than a company that services just 5,000. DO: Look for sites with money-back guarantees and/or short-term contracts. DON’T: Agree to a long-term contract unless you’re supremely confident. Know what’s worse than a bad host? Realizing that you’re stuck with it. Even if our readers follow all of our “dos,” choosing the wrong platform or the wrong plan still has the possibility of happening. How does that happen? As it turns out, it’s quite easy. Missing some small detail that ends up making a big impact on a site’s plans. Hosting needs change — perhaps it’s deciding to add an online store, or the business has grown far more quickly than anticipated. The guaranteed uptime the web host promised is falling short of expectations. Reaching bandwidth or storage limits far quicker than expected. The site is way too slow. When calling customer support, there is either no answer or bad answers. Most of the time, a bad pick isn’t the customer’s fault, but that doesn’t change the fact that making a move is in order. That move will be infinitely easier to accomplish if you aren’t mere weeks into a two-year contract. Look for hosts with money-back guarantees. A lot of platforms offer 30- or 45-day trial periods. Pick a host that’s set up for scalability. A web host that has the hardware and tech support needed already on hand will make it less likely that a customer will have to jump ship. A host that will let users upgrade their plans at any time is a major plus too. See if the host charges for website transfers before signing up. If changing hosts ends up being necessary, it’ll be a lot easier if there have a low-cost exit plan. To see which platform fits all of the top criteria, check out our comprehensive reviews of the 10 best web hosting companies of 2017. Alana Musselman is a copywriter, content strategist, and unabashed digital marketing enthusiast. In her previous professional lives, she was a chef, sommelier, and touring musician. These days she uses her laptop-based talents to help companies shape their brand story and make a lasting impact. When she’s not busy creating websites and crafting content calendars, Alana writes for a number of high-profile publications, starting conversations about everything from Cabernet to click-through rates.